Extremists assassinate Anwar Sadat in Cairo, 1981. The assassins’ bullets ended the life of a man who earned a reputation for making bold decisions in foreign affairs, a reputation based in large part on his decision in 1977 to journey to the camp of Egypt’s foe, Israel, to make peace. President Sadat was the first Arab leader to recognize the state of Israel since its creation in 1948. In September 1978, he met with Israeli Prime Minister Menachem Begin in the United States, where they negotiated a peace accord and, in 1979, a peace treaty. For their achievement, the leaders were awarded a joint Nobel Peace Prize. However, Sadat’s efforts were not so highly acclaimed in the Arab world. Arab states boycotted Egypt for breaking ranks and negotiating a separate treaty with Israel. On 6 October 1981, a victory parade was held in Cairo to commemorate the eighth anniversary of Egypt’s crossing of the Suez Canal. Sadat was protected by four layers of security and eight bodyguards, and the army parade should have been safe due to ammunition-seizure rules. As Egyptian Air Force Mirage jets flew overhead, distracting the crowd, Egyptian Army soldiers and troop trucks towing artillery paraded by. One truck contained the assassination squad, led by Lieutenant Khalid Islambouli. As it passed the tribune, Islambouli forced the driver at gunpoint to stop. From there, the assassins dismounted and Islambouli approached Sadat with three hand grenades concealed under his helmet. Sadat stood to receive his salute. Anwar’s nephew Talaat El Sadat later said: “The president thought the killers were part of the show when they approached the stands firing, so he stood saluting them”. 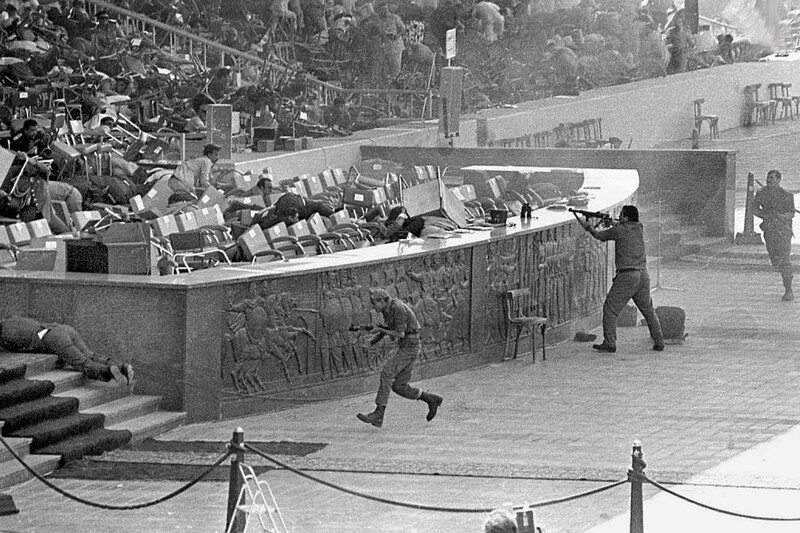 Islambouli threw all his grenades at Sadat, only one of which exploded (but fell short), and additional assassins rose from the truck, indiscriminately firing AK-47 assault rifles into the stands until they had exhausted their ammunition and then attempted to flee. 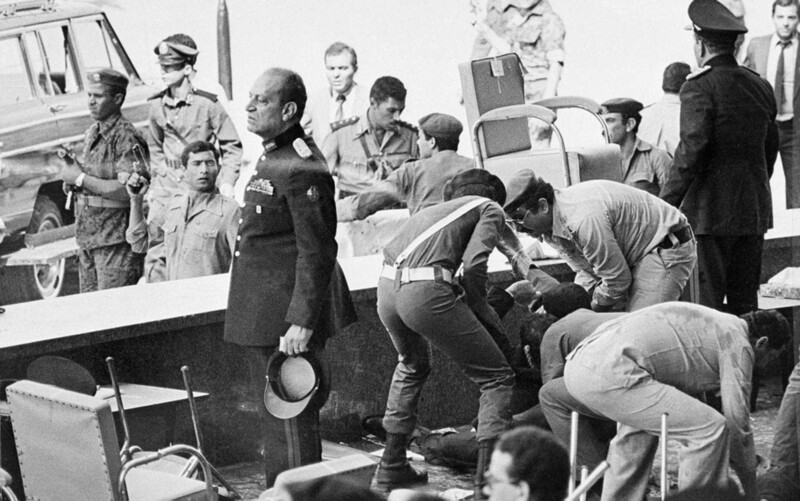 After Sadat was hit and fell to the ground, people threw chairs around him to shield him from the hail of bullets. The attack lasted about two minutes. Sadat and ten others were killed outright or suffered fatal wounds. Security forces were momentarily stunned but reacted within 45 seconds. One of the attackers was killed, and the three others injured and arrested. Sadat was airlifted to a military hospital, where eleven doctors operated on him. He died nearly two hours after he was taken to the hospital. Sadat’s death was attributed to “violent nervous shock and internal bleeding in the chest cavity, where the left lung and major blood vessels below it were torn”. In addition to Sadat, eleven others were killed, including the Cuban ambassador, an Omani general, a Coptic Orthodox bishop and Samir Helmy, the head of Egypt’s Central Auditing Agency (CAA). Twenty-eight were wounded, including Vice President Hosni Mubarak, Irish Defence Minister James Tully, and four US military liaison officers. The assassination was undertaken by members of the Egyptian Islamic Jihad. A fatwā approving the assassination had been obtained from Omar Abdel-Rahman, a cleric later convicted in the US for his role in the 1993 World Trade Center bombing. Islambouli and the other assassins were tried, found guilty, sentenced to death, and executed by firing squad in April 1982.